Our modular approach offers three levels of PRM management, enabling you to choose the right package for your airport’s needs – for today and in the future. 1. Automated processing of PAL/CAL messages into an agreed format on a daily batch basis – available via email or download link. This allows your airport to maintain current system, saving the cost of manual entry of data and the opportunity for errors or omissions. 2. Live feed of latest messages, with PSM confirmations and estimated arrival times. This allows your airport to replace existing systems and record passenger journey information online. Producing accurate reliable reports and improved analytics. 3. 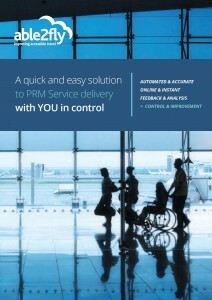 The complete PRM management solution, allows management to view passenger progress through the airport – in real time via NFC and/or Beacons. Full reporting suite enables critical analysis of service provided. Within the space of a few days, your airport could have its PAL/CAL notifications processed and verified automatically by our systems – drastically improving data accuracy. This can be followed by the implementation of our full system package within a few weeks.